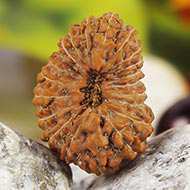 Often people have confusion on how they should select the right Rudraksha for themselves. It is important for the bead to be healthy and well formed. Beads that have holes due to insect bites, or are lightweight due to underdevelopment do not yield results. At Rudra Centre, we ensure that you get fully formed, healthy beads. You may choose Java or Nepal beads according to your preference. Both are effective as far as long term results are concerned. Nepal beads are large in size, have clear mukhis, look beautiful and have large surface area and hence strong intensity and quicker results. Java beads are small and wearable and hence discreet to wear. We regularly receive testimonials for both Java and Nepal beads, which proves the efficacy of both types. Size is also matter of personal choice. Some like small sized beads, while some love collector Giant beads. We ensure that all beads are beautiful, clear and uniform. We recommend you to consult Neeta Singhal before preparing any combination. She has studied the effects of the beads in great detail and she is best guide to tell you what you should be wearing and how. Please click on link below for consultation.